Buying a new boat is a complicated process with many factors to consider. Naturally, you’ll have a few questions to ask the dealer before you pull the trigger on buying your first new yacht. Identifying the information you need to make an informed buying decision is an important first step in the process. When you’ve prepared a list of question to ask your dealer, you can avoid making an impulsive decision based on emotion. 1. What Warranty Does the Boat Have? It’s very important to verify the boat is covered under a manufacturer’s warranty. 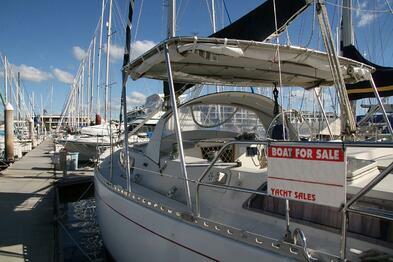 Not only should you confirm that the boat has a warranty, you should inquire about the fine print. In many instances, deciding between two similar boats could come down to the one with a better warranty. Ask questions about the details of the plan. First, find out which components are covered and not covered. Inquire about lifetime coverage for major components of the vessel, like the hull or deck. Often, they’ll come with limited-lifetime coverage. Other parts like the engine may come with a separate limited warranty, excluding them from the manufacturer’s warranty. In this case, you’ll need to make sure the dealer will honor the manufacturer warranty in addition to the warranty for the individual components. 2. How Much and What Kind of Maintenance Does the Boat Require? The price tag of a boat is what most new buyers focus on, but it’s also critical to get a clear idea of the kind of maintenance costs your boat will require. While a new boat has lower maintenance costs than a used boat, all require engine maintenance, cleaning, hull maintenance, and storage. For those in regions that require it, you’ll also need to factor in winterizing, haul-out, spring make-ready, and launch. Other variables that can affect annual maintenance costs include the boat type, how often it’s used, and if it’s primarily used in freshwater or saltwater. Another cost to consider is storage. When you buy a high-end yacht, you'll likely keep it at a marina. The larger the boat, the higher the storage fees. The largest of yachts require a crew, so if it’s applicable to your situation it’s another important factor in the annual cost of ownership. 3. What Kind of Fabric Is on the Boat? You should inquire about the quality of accessories and components on any boat you’re considering for purchase. One of the most important parts of a boat is its enclosure fabric. Standard canvas fabric doesn’t provide an optimal experience, so you may want to ask about upgrading to a better quality material. If the boat fabric is of lower quality, it may need to be repeatedly replaced, which is costly and may keep you from enjoying your boat to the fullest. Ensure any fabric that’s used on your yacht is the high-quality. One type of marine fabric that stands above the competition is made by longtime fabric pioneers Herculite. Their line of marine fabric comes in a range of colors is more durable than other materials. The fabric is used for a variety of boat components, including convertible tops, flybridge covers, cockpit covers, and drop curtains. They protect you, your passengers, and even the boat from the elements. You need to inquire about financing options when buying your first new boat. Securing a boat loan is more like a getting a mortgage than an automobile loan. There’s a lot of risk for boat loan lenders; defaults are more likely on boat loans than mortgages or car loans. Additionally, repossessing a yacht is more difficult than foreclosing on a home or impounding a vehicle. Because of this, many dealers are cautious about the types of financing offered and consult with attorneys that specialize in marine loans before reaching any agreement. The higher your net worth and credit score, the better your financing options. In addition to consulting with the boat dealer on financing options, you should also speak with your tax, legal, and financial advisors about the best options for financing. 5. Can I Take It For A Sea Trial? Before you close the deal on a new yacht, insist on taking it out for a test drive. In the boating industry, this is known as a sea trial. You should never purchase a boat before taking it out for sea trial. If a dealer refuses to allow you take the boat on a sea trial, it should be a major red flag. On this test drive, you’ll be able to test everything about the boat. You can check the electrical system, sit in the driver’s seat of the boat as well as the various passenger seats, and get a general feel for what it’s like to use the boat for a day at sea. Learn when you can DIY and when you can't with marine vinyl projects. Get our guide.